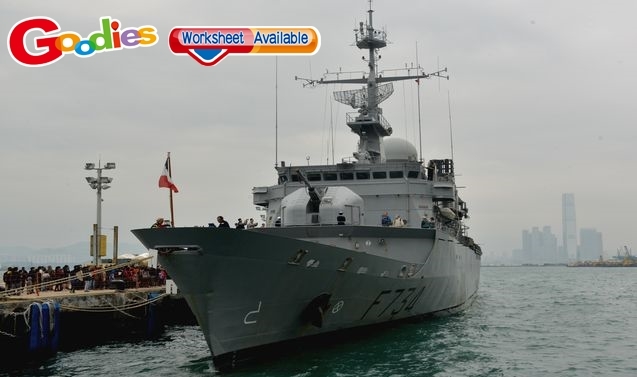 A FRIGATE from the French (法國的) navy arrived in Hong Kong in late February. The Vend?miaire stayed for five days and welcomed 700 visitors on a first-come-first-serve basis. The captain of the ship, Alexander Blonce, said a drill with two ships from the Chinese navy was planned. Vend?miaire has already been to Hong Kong four times, the last being in 2013. The ship was equipped similarly as the last time, with a helicopter and various cannons, but the cannons have never been used in real combat. All 93 officers on the ship are French citizens, with 15 women. Blonce added that this is the first time he and many of his shipmates have been to Hong Kong. The ship berthed at China Merchants Wharf in Kennedy Town (堅尼地城). Visitors were allowed to take photos of the ship from land, but those boarding the ship needed to go through security.